I begin with a proposition adapted from Wendell Berry—namely, that mowing is an ecological act. Mowing extends the perennial drama of photosynthesis and carbon cycling. Too few lawn owners, however, are aware that this is true. They think of grass as a plant, perhaps, but they do not think of themselves as participants in an ecosystem, or, as Aldo Leopold would have it, as “member and citizen” of the “land-community” (which he defined as soils, waters, plants, and animals). And speaking of Leopold, another passage from “The Land Ethic” sums up the current state of lawn mowing. He writes, “Your true modern is separated from the land by middlemen, and by innumerable physical gadgets. He has no vital relation to it.” Indeed, the many intercessions of the lawn care companies and the corporations producing “zero-turn” riding lawnmowers pretty well drain the vitality out the relation between lawnowner and land. My neighbors notice the signature I am mowing into my property, and two of them have offered me the use of their lawnmowers. Seen from their perspective, I am sure my writing is hard to decipher if not illegible. It probably looks more like the scribblings of laziness, penny pinching, or both. And so here I offer an explanation. Use a gas powered lawn mower (we are still complicit in the sins of the power companies, but we aren’t producing exhaust or excessive racket). Discriminate (while we make our fair share of “invidious distinctions” between weed and not-weed in the garden, the minerals pulled upward by dandelions’ taproots and the nitrogen fixed by white clover mean that we don’t “weed and feed” the lawn). Mow when it’s wet (else we’d squish out the air in the soil and would have to aerate). Mow when it’s too dry (else the lawn will dry out and turn brown all-the-faster). As you might guess, this regimen of mowing means that sometimes the lawn looks a little shaggy. But even at those times, the lawn is an oasis of order compared to the remainder of our land. Leopold might also go easy on me because I think about what and when to mow. My timing is irregular; I try to mow just before that moment when the cut grass would pile up deep enough to mulch and kill the remaining plant. My pattern, too, is irregular. Gene Logsdon’s Wildlife in the Garden: How to Live in Harmony with Deer, Raccoons, Rabbits, Crows, and Other Pesky Creatures (1983; 1999) convinced me that leaving some grass unmown would provide habitat for bugs (some of them beneficial) and other critters (all of them interesting). So along the contours of the orchard and the pasture, there are unmown stripes that feature waves of greening and browning as the seasonal grasses grow and senesce. These stripes pulse with fescue, then orchard grass and clover, and finally broom-sedge. They are a kind of slow motion chlorophyll strobe light, and they make for a signature I like the look of. Ethan Mannon lives in the Blue Ridge Mountains of North Carolina with his wife and their dog. 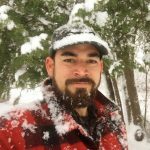 He is an Assistant Professor of English at Mars Hill University, where he teaches American and Appalachian Literature, as well as composition, and coordinates the Regional Studies Program. I have been contemplating my mowing needs lately, so this fine reflection comes at a good time for me. Maybe the author or someone else can give me some practical guidance. My family just moved onto a half-acre plot that is mostly in grass, uneven, sloping, rocky, and dotted at regular intervals with bushes. 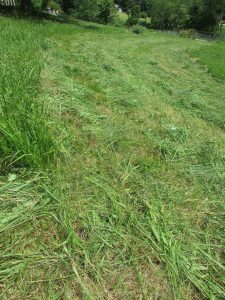 We hope to take this mostly out of grass in time, but for now it feels like I need something more than my reel mower to manage it: we’re about to have our third child, and I’m not sure how many hours I can spare to mowing. (Plus we live in tick country, so I feel I should stave off Lyme disease by exercising some amount of control over the height of the grass.) I have lusted over these very same Italian walk-behind tractors, but I’m not sure I can justify the expense just yet given the size of our plot. 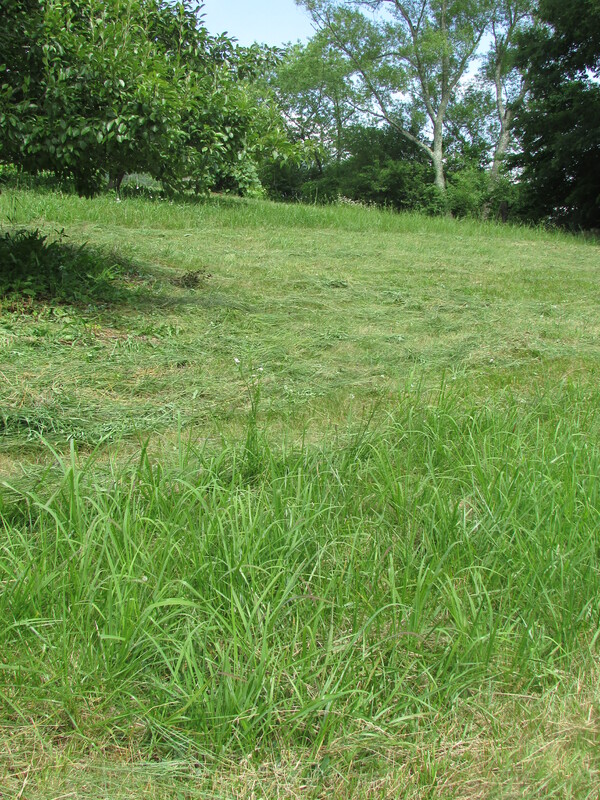 Is there a medium-scale option for more ecologically sensitive mowing? Maybe I’m looking for a sickle or scythe? Ethan: this was a thoughtful piece that should inspire non-HOA property owners to see new possibilities to practice regenerative land management while doing (or not doing) a common chore. Matt: depending on where you live, there are usually several options for low or no-mow grass varieties that might work for reduced-maintenance ground cover. In SE Michigan (where we also see our fair share of ticks) I’ve had good success establishing creeping red fescue to an acre or two of forest under-story that only needs to be mowed once or twice a year. Thanks, Mark. I’ll look into the red fescue. At our last house, I was working to put much of the lawn into creeping thyme and German chamomile, which are delightful ground covers that I want to put in again. In time, I hope to be rid of the need to mow altogether, or nearly.